Have you ever wanted to be an ancient sorcerer and have control over elements? Have you ever wanted to battle with other sorcerers and see who the best is? Well now you have the chance with Sorcerers’ Skirmish from Wildflower Games. Sorcerers’ Skirmish is a new card game coming in March to KickStarter. Players will use their spell decks to command 4 elements and battle against 2-4 opponents. Sound like a blast? Let’s take a look and see. In Sorcerers’ Skirmish, players will take turns drawing, declaring, casting and resolving spell cards. Each sorcerer’s deck has identical elemental spells but how each player uses their deck is key. Aside from their spells, players should also use any other means to win. Players can count cards, bluff, use logic and hopefully have some luck on their side to be crowned the winner! To setup the game, each player is given a spell deck which they will shuffle. The decks are separated by color, but each has identical spells. 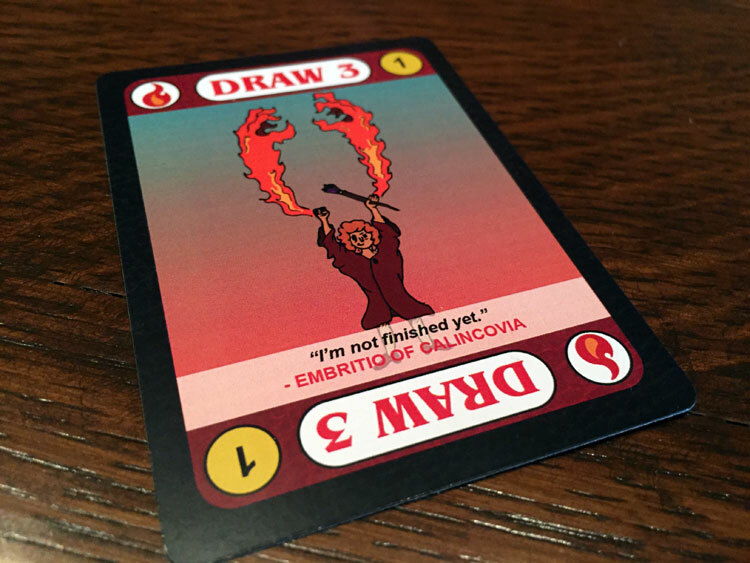 Once shuffled, each player draws 3 cards. Each player also has a health dial which they set to 13 to represent their sorcerer’s starting health. Each spell card outlines the elemental and spell type plus flavor text and art. Draw: Any player with 2 or fewer spell cards draws 1. Declare: When playing with 3 or more players – you must declare which player is your spell target; the player to your right or left. A player secretly chooses which player and when all players are ready, they then reveal who their target is. Cast: Each player takes 1 spell card from their hand and places it face down in front of them to represent their queue. 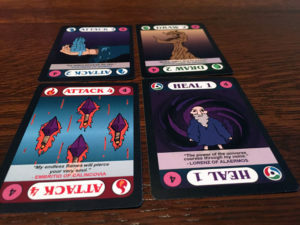 Players then simultaneously reveal their cards to show which spell they are using. Resolve: There are 4 elemental spell forces. Fire, Grass, Water and Chaos. Cards are resolved in the following order: Fire spells beat Grass Spells, Grass beats Water, Water beats Fire, and Chaos beats Fire, Grass, and Water. The player with the winning elemental spell revolves their spell. The losing element spell has no effect. After spells are resolved, they are discarded unless there is a Duel – see below. Spell Actions: There three spells actions: Attack, Heal and Draw. Attack is the only spell that affects the targeted player. Heal and Draw affect the player casting. Duel: When two players declare each other and cast spells of the same element type there is a Duel. Both spells do not have any effect and the spells stay in the player’s queues. Both players in a Duel must declare each other in the following turns until the Duel is resolved. The Duel is resolved when a player resolves a spell that beats their opponent. The winner then resolves all other spells in their queue. The losing player discards all spells cast and in their queue with no effect. A player is eliminated from the game when their health equals 0 or less at the end of the resolve phase. The last player left is the winner. 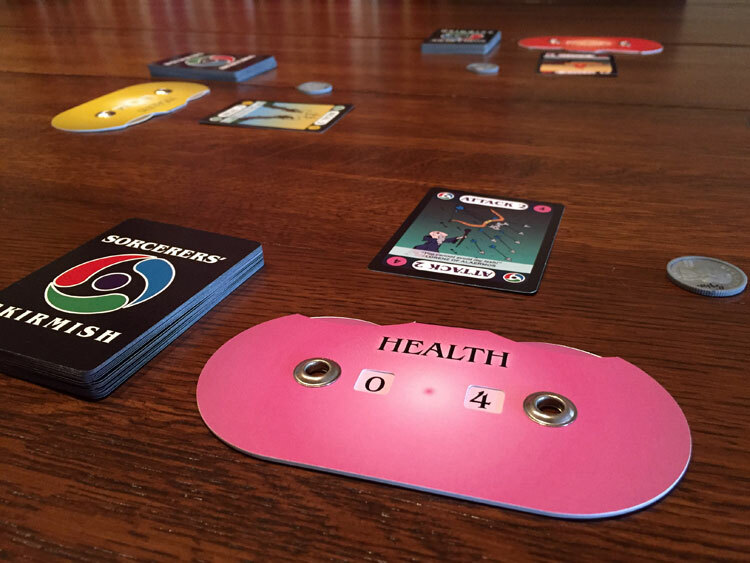 This light card game is fast paced but players need to watch their health because it will go fast as well. Out of the gates, I have to say that Sorcerer’s Skirmish is a fun game. It’s both easy to pick-up and master. It’s also one of those games that easily gets to the table because it’s fairly light and has a short play time (30 minutes). As Wildflower Games notes in the preface of the rules, this game is based on Rochambeau or better known as rock-paper-scissors. Now that description may or may not appeal to all but it does fit the game play perfectly. From the How To Play section, you would correctly guess that Sorcerers’ Skirmish is not a heavy strategy game. What will surprise you is that it plays more like a game of chance than just a simple card flipping game. This game makes you read other players. As you play, you’ll be bluffing and trying to anticipate the other player’s moves. In the 3-4 player game, you’re constantly wondering who will target you and what they will cast next. The four element spell types include: attack, draw, and heal cards so there’s plenty of options for players each turn. I will say that I did play this one with my family and would classify this game as a good family, filler, and even gateway game for new and younger players. Again, the rules are easy to learn and the low strategy level should appeal to younger or first time gamers. There’s nothing intimidating about Sorcerers’ Skirmish except what your opponent will cast next. The one play aspect that did surprise me was the Duel. When I read the rules, it really didn’t appeal to me but during our first play, I was locked in a Duel and it was a pretty cool mechanic. The winner does get to unload on their opponent and can gain health and cards. What I liked most about the Duel is that it can be somewhat of an equalizer in the game if you’re playing from behind. The only negative about the Duel is during the higher player count, other players not locked in a Duel typically pick on the players involved, which again, can help players catch up but can also increase someone’s lead. Attack is the only spell that affects the targeted player. Heal and Draw affect the player casting. It’s important to note that since Sorcerers’ Skirmish is a card game that it is influenced by the luck of the draw but not ruled by it. By giving players multiple cards at the start, spell cards that allow player to draw, and no hand limit, players have options throughout the game and this gives them a good sense of control. Players at times will suffer through the luck of the draw but overall, players should not feel it heavily influences the game. It’s also worth noting that any gamer should like the fact that there’s little downtime in the speed of play. The turns are fast and are even faster in the two-player game because players can skip the Declare phase. 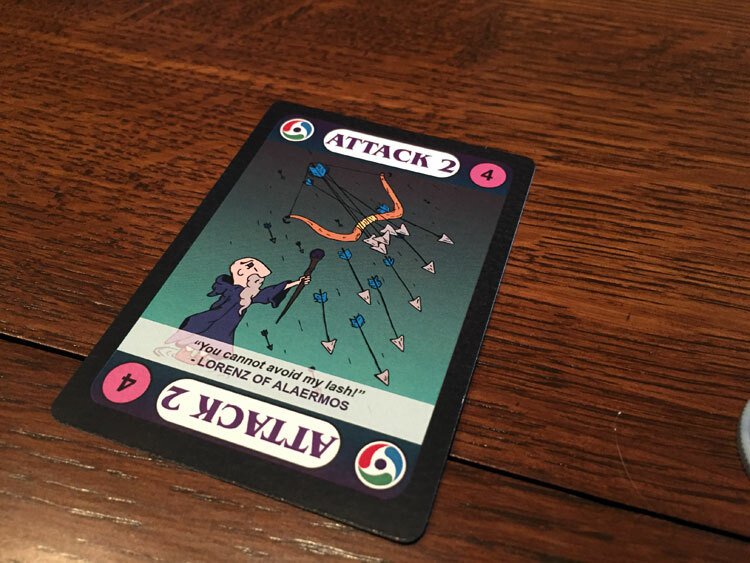 You’re fairly engaged throughout wondering what opponent’s draw, who will they target, and what will they cast. You’ll be constantly looking for them to make a mistake so you can get the edge toward victory. 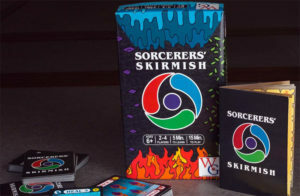 If you are looking for a fast paced, light card game, then Sorcerers’ Skirmish is definitely worth checking out. This one should be fun for any gamer young or old and should also appeal to new gamers as well. 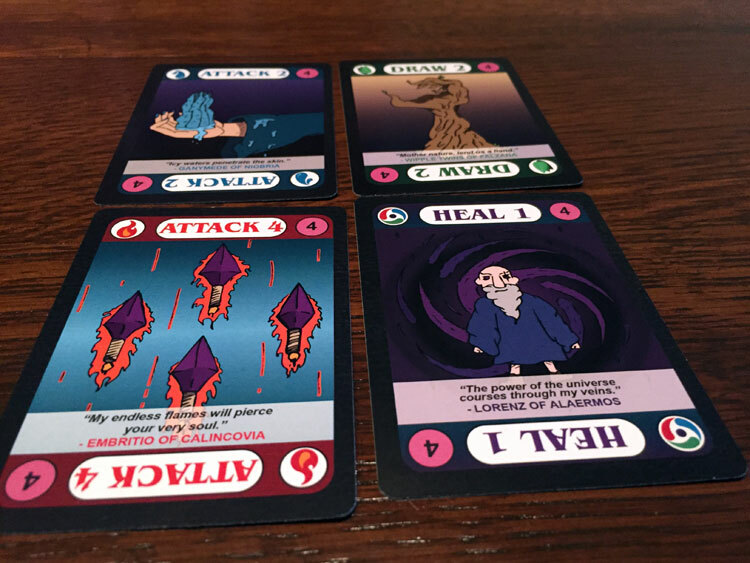 Sorcerers’ Skirmish has plenty of decision-making options, so the luck of the draw does not solely drive the game play like some other card games. If you’d like to become a backer, pledges start at $18 for the full game and stretch goals. Sorcerers’ Skirmish is scheduled to deliver in October 2017, so head over today and check it out.